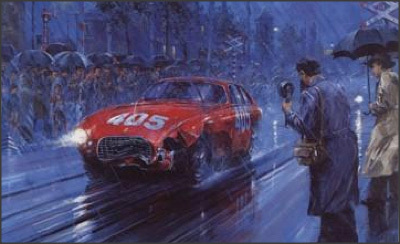 Gigi Villoresi and co-driver Cassani are shown in atrocious weather conditions on their way to victory in their Ferrari 340 America. After Villoresi slid off the road near Ferrara, the big 4100cc 12 cylinder Vignale coupe suffered extensive damage and part of the bodywork had to be cut away to change the wheel. The gearbox then began to give problems during the ascent of the Futa Pass, eventually jamming itself in top gear. However, in a heroic drive, Villoresi went on to average 76.1 mph over the 978 miles of the Brescia-Rome-Brescia course, winning the race by 20 minutes from the Lancia of Giovanni Bracco and disproving an old Mille Miglia saying ‘he who leads at Rome never wins’.